As we are on the eve of a new year...there's really no theme to this one. This week's AGM had quite the travel log when all is said and done, going up and down one coast after going to and from both coasts. All in all, he got a lot of flyer miles, while getting some playing time with the Flyers. This week, the profile of Bobby Taylor. To start his career, Taylor played with his hometown Calgary Buffaloes for the 1962-63 season and 1963-64 season before moving out to Ontario to play with the OHA's St. Catherines Black Hawks for the 1964-65 season where he would play in 18 games. During the 1965 playoffs, Taylor was loaned to the Edmonton Oil Kings for four playoff games (1-3) and then into the Memorial Cup for three appearances (2-1). In the 1965-66 season, Taylor was signed by the St. Louis Braves, but never played with the team. For the 1966-67 season, Taylor went home to play in the Western Canadian Senior League for the Calgary Spurs for 16 games, helping them to the Allan Cup-- where he would go 6-4, but lose out in the Finals. Taylor stayed with the Spurs for the 1967-68 season for 27 games and three in the playoffs (1-2). Taylor would go on to be with the Canadian National Team at the end of that season, but wouldn't appear in any exhibitions. The Philadelphia Flyers would sign Taylor in the summer of 1968 and then assign him to the Eastern League Jersey Devils, where he would go 25-38-7 record in 70 games. It was an adventure for Taylor in the 1969-70 season, where Taylor would play eight games for the Devils, then go to the Western League to play for the Seattle Totems in five games, then ending up playing 14 games with the AHL's Quebec Aces, where he would also play two playoff games (1-1). Taylor would setting down with the Aces in the 1970-71 season, posting a 13-15-8 record in 39 games. For the 1971-72 season, Taylor would stay in the AHL, but play for the Richmond Robins for 26 games for a 7-14-4 record, but also appear in six games with the Flyers (1-2-2). 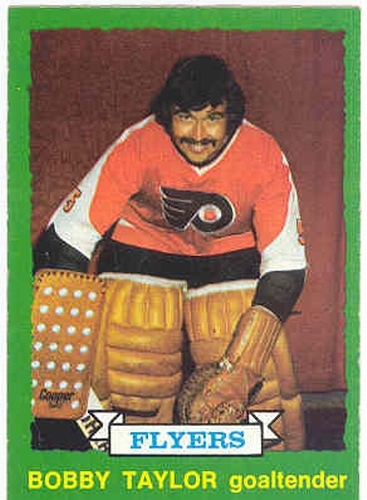 The Flyers would be Taylor's destination for the bulk of the 1972-73 season behind Bernie Parent-- going 8-8-4 in 23 games, as well as spending six games in Richmond. It would be a split season for Taylor starting in the 1973-74 season, playing in 11 games with Richmond (4-4-3), then eight games with the Flyers (3-3-0) and would be a part of the Stanley Cup team with Philadelphia in those playoffs. It was another split season in the 1974-75 season, playing in five games for Richmond (3-1-1) and three for the Flyers (0-2-0) and once again along for the ride in another Flyers Stanley Cup victory. Third time was a charm for Taylor in the split, this time only appearing in four games for the Flyers (3-1-0) and then four for the Robins (0-2-1) before finally getting some reprieve. In March of 1976, Taylor and Ed Van Impe were traded from Philadelphia to Pittsburgh for Gary Inness. Taylor would only play in two games for the Penguins (0-1-0), then spend the rest of the time in the AHL with the Springfield Indians for 23 games and go 7-14-0 before hanging up the pads at season's end. Post-hockey, Taylor would go into the broadcast booth, joining the Flyers broadcasting team from 1976 until 1992. He would then join the Tampa Bay Lightning broadcast team, where he is the color commentator for the TV side. Though he had a rocky side of junior hockey, then sat out a season-- Taylor made a pretty decent career for himself. Granted, the trips up and down Interstate 95 in the 70's probably took it's toll, but at the same time he was able to experience two Stanley Cup runs, even if he didn't appear in a game. Since we last left you-- the Fort Wayne Komets seem to be the only consistent team out there. Many of the other teams have slipped just a bit, though their standings don't necessarily say as much. However, one surprise is that the Sherbrooke Phoenix are playing pretty well and after the Christmas break should have healed them up-- they'll make a run at the last spot of the QMJHL playoffs, as they are just behind the Cape Breton Screaming Eagles. The Spengler Cup is the often forgotten relative in the holiday tournament scene. Though it is the oldest European club tournament, founded in 1923 as a way to help German speaking Europeans after World War I and started by Dr. Carl Spengler. It's hosted by HC Davos in Davos, Switzerland at the fantastic Valliant Arena, but it wasn't until 1979 when the tournament went indoors. HC Davos is there as the host and usually there's a representation from Hockey Canada that plays; as well as four other teams that are brought in by invitation only. With the NHL lockout, the tournament has brought a lot of big names, especially with Canada actually making their team a mix of NHLers who may not have played yet this year (Ryan Smyth, Devan Dubnyk), NHLers who are playing Switzerland (John Tavares, Tyler Seguin), and other Canadians who play in Switzerland (Josh Holden, Micki Dupont). On top of it all the likes of Joe Thornton and Patrick Kane have graced the roster of HC Davos, Cory Schneider and Max Talbot on Fribourg, as well as Jason Pominville and Dennis Seidenberg on Mannheim. 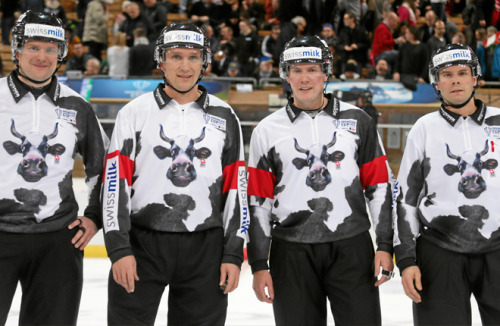 The interesting part about this is not only the cavalcade of Canadian players that come from Switzerland and Europe to make up the Canadian team, nor is it the referee jerseys looking like a cow; but the fact that there's plenty of guys from other teams in the same league in order to play for one of the invited teams. One of which is Patrick Kane, who doesn't play for Davos, but is coming over from another Swiss League team: EHC Biel. Also going to Davos from Biel is Reto Berra, who was supposed to help the Davos goaltending situation. Max Talbot goes to play for Fribourg after spending the season so far with the Finnish League's Ilves, while Cory Schneider plays for HC Ambri-Piotta, but is in net for Fribourg. Teams are allowed to bring in three skaters and a goalie for reinforcements, but often times teams don't do that. Davos is a team who puts it into a big effect in order to put on a great show for the home crowd. For me, I often wonder why a team would want to bring in other players from their opposition to play for them, even though this is an invitational tournament and you want to have the best players on the roster in order to win it all. Even with that, one would think that it would be an issue and hope that you don't get your "secrets" stolen because you bring in "spies" from other teams to play in a chance to win it all. While you can imagine that the neutrality of the Swiss nature is there, it still is a risky venture and something that makes me scratch my head as an outsider. More over than that, the team the loans out their players have to hope that in some aspect-- they don't get hurt because often it's their best players that are transferred out. Espionage storyline that I've made up in my own head aside-- the practice is something that is a very fun thing to see, especially when a short tournament like this happens and some guys who wouldn't have gotten to experience it otherwise. It's a high-tempo week with only a guarantee of three games and is one of the more prestigious, if not little known, championships that not many get a shot at. Not only that, but you wonder why there's not more of these kind of invitational tournaments in North American pro ranks. For me, the Spengler Cup is one of the better tournaments out there because of it's exclusivity and little rules such as the reinforcements, plus it's played at one of the most badass arenas out there. This week's AGM is a goalie who was able to be a workhorse in the junior leagues, but was never able to stay healthy enough in the pros to show off his talents. Of course, it could be a harder transition for him, but he did what he could and then moved to a teaching role after learning so much. This week, the profile of Jacques Cloutier. Cloutier started his trek in the QMJHL with the Trois-Rivieres Draveurs starting in the 1976-77 season, playing in 25 games and posting an 11-6-2 record. Starting in the 1977-78 season, Cloutier became a workhorse for Trois-Rivieres, playing in 71 games of the team's 72-- compiling a 46-17-7 record, then going 12-1 in the playoffs, helping them win the QMJHL Championship. Cloutier would go 1-3 in the Memorial Cup that season. Cloutier played all 72 games for Trois-Rivieres in the 1978-79 season and had a 58-8-6 record, then 12-1 in the playoffs again, then 2-2 in the Memorial Cup. After the Buffalo Sabres drafted Cloutier in 1979, he had his workload cut down, playing only 55 games in the 1979-80 season, finishing with a 27-20-7 record-- then 3-4 in the playoffs. Turning pro for the 1980-81 season, Cloutier would head to the AHL with the Rochester Americans; getting into 61 games and coming up with a 27-27-6 record. In the 1981-82 season, Cloutier went 14-7-2 in 23 games in Rochester, while being called into duty for the Sabres and putting up a 5-1-0 record in seven games. Cloutier stayed with Buffalo for the bulk of the 1982-83 season as a back-up (10-7-6), but the Sabres traded for an experienced back-up; putting Cloutier back in Rochester-- where he would go 7-3-1 in 13 games, then posting a 12-4 playoff record lifting Rochester to the Calder Cup. The 1983-84 season, Cloutier was back in Rochester playing in 51 games with a final count of 26-22-1 and then going 9-9 in the playoffs. In the 1984-85 season, Cloutier would play 14 games in Rochester (10-2-1) and one game in Buffalo (0-0-1) before he tore some of his knee ligaments, putting him out for the rest of the season. The injury would keep Cloutier out until midway through the 1985-86 season, but he would get into 14 games with Rochester (10-2-2) and then 15 for Buffalo (5-9-1); then playing five games for Canada in the World Championship, helping the country get bronze. 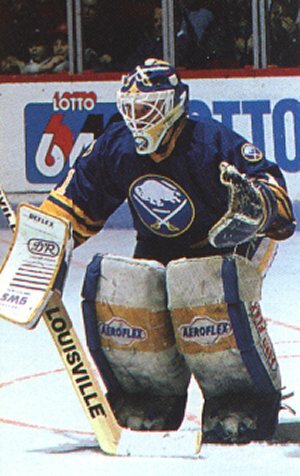 Thanks to injury and inconsistent play for Tom Barrasso, Cloutier was able to stay up with Buffalo for the 1986-87 season, going 11-19-5 in 40 games, but the 1987-88 season saw Cloutier get into a logjam in Buffalo, playing only 20 games and posting a 4-8-2 record in that time. In the 1988-89 season, Cloutier was still in the logjam, but injuries and a horrific moment to Clint Malarchuk would put Cloutier in the spotlight. Cloutier would have a 15-14-0 record in 36 appearances and would go 1-3 in the playoffs. Also, Cloutier spent 11 games in Rochester, but with a lackluster 2-7-0 record. Before the 1989-90 season, Cloutier was traded to the Chicago Blackhawks, where Cloutier would be a starter in that season for 43 games and compile an 18-15-2, then going 0-2 in four playoff games. Cloutier was hung up in another logjam in Chicago during the 1990-91 season-- being pushed out by Ed Belfour and then Dominik Hasek-- only getting on 10 games with a 2-3-1 record. During January 1991, Cloutier was traded to the Quebec Nordiques and would finish the season there, appearing in 15 games with a 3-8-2 record. As a back-up in 1991-92, Cloutier appeared in 26 games and posted a 6-14-3 record. Cloutier was the third goalie during the 1992-93 season for Quebec, only appearing in three games and going 0-2-1. The 1993-94 season, brought more games for Cloutier-- but finishing with a 3-2-1 record in 14 appearances. After that season, Cloutier would retire from playing. Cloutier stuck to hockey, but hired by the Nordiques as an AHL assistant coach with the Cornwall Aces from 1994 until 1996, then being promoted to assistant/goalie coach of the Colorado Avalanche-- winning Stanley Cup rings in 1996 and 2001. He was let go by the Avalanche in 2009, but would go over to Switzerland to help coach with Bob Hartley and help the Zurich Lions win a league championship and moved with Hartley from Switzerland to Calgary to be the assistant coach of the Flames whenever the lockout ends. Junior stand-out that got hampered by injury and during a time where goalies were plentiful, Cloutier was part of the casualties that, but did make a good enough name for himself and had his mind for hockey-- transitioning it to a solid coaching career. In the "Seinfeld" tradition of Festivus, it's time for the airing of grievances. AND I GOT A LOT OF PROBLEMS WITH YOU PEOPLE. NHL and NHLPA: Let's get it together. Enough about seeing who's junk is bigger and talking all this noise and actually maybe put that energy to better use. In a world that seems to be all about who "wins" and who "loses," sport is usually the getaway from that...but it's not. It's the same high school drama we've had to deal with for years and you're making an already niche sport less relevant. NHL-Only Fans: I get that you miss the league, but please let's stop actually saying that all of hockey is over. Sure, the main league is a big loss, but the expansions of horizons about the game as a whole is not a bad thing. Sad that Nike only increases that stereotype that just because the NHL is gone, all of hockey is gone. Minor League Fans: Let's not push the agenda that there's actual hockey out there because of course it is. It's not for everyone and it's not supposed to be for everyone. Why are you trying to blow up your little secret you have only to get interlopers in there and ruin the fun for everyone else when they say that it's not as good as the NHL. It only gets you down and make the minor leagues look that less credible. Silly Twitter Accounts: It's great to laugh at these little nuances that happen during the Lockout, but the fact that the NHL podium (or lectern if you're a proper jerk) had a Twitter account and people got excited about it shows that NHL fans will flock back easy and almost makes the fans look silly to other sports out there. Punditry: Enough with the bi-polarness of your reporting. The emotional rollercoaster you put everyone on is almost sickening and makes me believe that you're masochistic and enjoy getting everyone up to let them down-- enough of you. Lip-Synching Songs: It was cute at once, but much like alternate jerseys-- the oversaturation of the marketplace has made it horrific to even watch the cringe-inducing nature these players put themselves though. I understand this world is all about going viral because everyone wants to be famous-- but come on. Christmas songs are depressing and there's so few that are any good. We all love Mariah Carey, but it doesn't mean you need to keep going on and on with her song. Enough. I'm sure there's some more, but I've lost my train of thought. 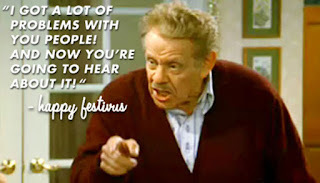 Now...the feats of strength. "I'm not sure the NHL returns with 30 teams on the other side of a lost season. Can the weaker markets truly survive this? That's damage both sides would feel." Even Forbes has made the argument for contraction, thinking it could be the best hope and saying Western and Southern teams aren't hockey markets and the "fans" are "fans" at all. They know something about money, but I don't know about pleasing the masses. If that were to happen, it could do much more damage to the revenue stream and how it is divided or proposed to be divided in any projection that comes out. Sure, the lower teams wouldn't bring in much revenue; but any hit would skew the boat one way or another. Of course, the question becomes-- how many teams do you cut to make the league healthy again?? Is it two, four, 10?? The question will vary depending upon what people believe from their own view. And while the lower market teams would take away some money-- those teams could be the ones bleeding the money, as well-- thus making their elimination something that could keep the league healthy under whomever terms and conditions the NHL and NHLPA agree on. That said, that's going to hurt the NHLPA as well for the obvious reason of jobs being lost by the players. Even if two teams are gone, that makes 64 players without jobs (based on the 23 players per roster ideal) and you can bet Don Fehr won't like that one bit...which means that Bettman and the Board of Governors could be touting this as a possibility soon. Which is what makes this whole lockout posturing insane. But we all knew that. In any case, the idea of contraction is something that could make the league better off than it is right now because it could cut cost of travel, lessen the amount of money lost, and while losing revenue in some sorts; it'll be for the greater health of the league and revenue sharing if something were to happen. Personally, I wouldn't mind seeing a couple teams taken out for the health of the league, but the fans who would suffer would probably revolt as it were-- though when has the NHL thought of the fans, am I right, folks?? Expect this to be the new talking point as this battle goes around and around into possibly the New Year. Unless there's a Christmas or Festivus Miracle, this thing will go on and on with teams, players, and fans hurting-- but maybe some other leagues reaping the benefits-- hockey or otherwise. In the course of a week, there has been two different articles talking about players being the "Crash Davis" of minor league hockey. NHL.com talked about Darren Haydar's time in the AHL, while Adrian Dater was all about Brad Smyth's cross-continent approach when playing. Haydar has played 23 NHL games over four seasons over an 11-year career and Smyth has 88 over eight seasons over an 18-year career; so I would give an edge to Haydar when it comes to the Crash Davis tag since he has much more of a "cup of coffee" status rather than Smyth. The idea of having two Crash Davis's confuses me because, much like the Highlander, there must only be one. Aside from the 1980s movie references, it got me thinking who could be the most minor league of minor league players. There has been many lifers in the lower leagues without getting the most notoriety when all is said and done. You have to go to the record books, obviously, to see who has the most games played and how they go about the minor league approach. The AHL has the types like Willie Marshall, who played in the 50's and 60's where the AHL itself was a very competitive league and had talent almost like the NHL, but were hooped because of the limited amount of teams in the NHL. Marshall did play 33 games with the Maple Leafs over four seasons, his last game during the 1958-59 season and didn't retire until 1971-72, finishing with a record 1,205 games in the AHL. Harry Pidhirny could be the biggest proponent of the Crash Davis tag, playing only two games in the NHL and 1,071 in the AHL. Fred Glover was in the older era as well, but played 93 games in the NHL and 1,201 in the AHL; as well Mike Nykoluk who played in 1,069 in the AHL and 32 in the NHL. More recently, Jody Gage and Bryan Helmer are over the 1,000-game plateau in the AHL, though Helmer did see 145 NHL games to Gage's 68. The ECHL has a lot of older soldiers of the minor league lifers, Cam Brown playing 789 ECHL, one NHL game, two IHL seasons, and 15 in the AHL; almost making him very much the lifer of all lifers. That is, until you see Louis Dumont's stat line, having him play 771 in the ECHL and only 10 games above the "AA" league system (5 AHL, 5 IHL) and 318 in the CHL, plus 14 in the British Leagues. Wes Goldie only played 697 games in the ECHL and only two AHL games to show for his career, as well as a stint in the Quebec Semi-Pro League. On the horizon, Boyd Kane is at 891 games (as of 12.17.12); but probably won't catch the 1,205 of Marshall, but could top the 1,000-game mark. You have Sam Ftorek chasing Brown's ECHL record and only 36 games away from surpassing Goldie's games played, while Randy Rowe would be on the list if he didn't have extended stints in the AHL a couple of times. Tyler Fleck is chasing Travis Clayton's CHL record of 880 games, but Fleck is at 733 and has Scott Wray (646) and Sebastien Thinel (591) on his tail-- though Thinel could be a little more set-up to overtake Clayton as he is a bit younger-- but injuries can halt many things. There's plenty of lifers in the minors that people don't know about, but all it takes is a lockout and need for news that makes these names come to light and makes people take notice to guys who have led a vibrant career in the minors, but may never get the chance to take NHL ice for a long time, if at all. For most of the AGMs, they aren't that successful and fade away after the hype. However, this week's was probably one of the more solid back-ups in recent memory, but just seemed to get shuffled out. Along with his ability to succeed back in his native country-- he decided to not play the logjam game and take it away from the NHL. This week, the profile of Martin Prusek. Prusek began his career in his native Czech Republic with HC Vitkovice in the 1994-95 season and would play 256 games for them from the 1994-95 season until the 2000-01 season, as well as having stints with the Czech national team as a spare goal in the World Hockey Championships in 1997 through 1999, where he received two Bronze medals and a Gold. During his time playing in his homeland, Prusek was drafted by the Ottawa Senators in the 1999 Draft and he would come over to North America for the 2001-02 season. During that season, Prusek spent most his time with the AHL's Grand Rapids Griffins, posting a 18-8-5 record in 33 games, then going 2-3 in the post-season. Prusek's first season in North America was great as he was AHL First Team All-Star, shared the Hap Holmes Award for fewest goals against with Simon Lajeunesse and Mathieu Chouinard, as well as winning the Baz Bastien Award for AHL's Outstanding Goaltender. The only game that Prusek played in Ottawa that season was a loss. 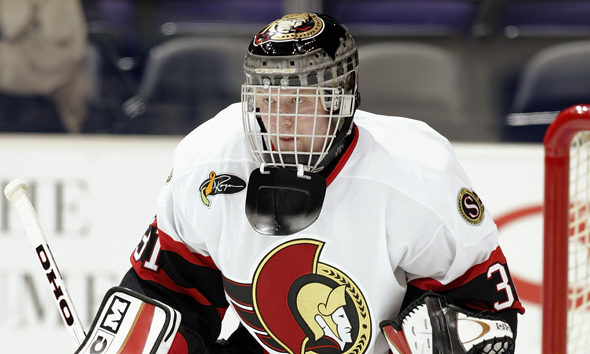 Trying to match the success in 2002-03 would mostly be done in Ottawa, as Prusek compiled a 12-2-1 record in 18 games as Patrick Lalime's back-up, while then going 1-2-1 in four games with the AHL's Binghamton Senators. Prusek's only full season in Ottawa would be in the 2003-04 season and he would put together a 16-6-3 record in 29 games. During the 2004-05 lockout, Prusek went home to play with HC Vitkovice for 14 games before he was loaned out to HC Znojmo for eight games. In those 22 games, Prusek combined for a 2.44 GAA during that time, though no records have been put out there. When the NHL return, Prusek returned to the NHL but with the Columbus Blue Jackets, whom he signed with in the summer of 2005. However, a logjam in Columbus' net caused Prusek to play in the AHL with the Syracuse Crunch, finishing 12-7-1 in 23 games, while when he got up to Columbus-- he put up a 3-3-0 record in nine appearances. Seeing himself getting pushed out, Prusek opted for the Russian Super League in the 2006-07 season with SKA St. Petersburg for 22 games that season, before returning to his home club in HC Vitkovice in the 2007-08 season for 45 games. In the 2008-09 season, Prusek joined the newly renamed KHL and played for 22 games with Spartak Moscow and 20 games for Dynamo Riga, while playing the 2009 World Championships with the Czech and went 2-1-0 in three appearances. Prusek returned to Dynamo Riga in the 2009-10 for 28 games before he would move back home. During the 2010-11 season, Prusek started to suffer some ailments in his chest and it was revealed that Prusek had carditis, which is an inflamation of the heart and the muscles around it. Prusek only played two games with HC Vitkovice that season before retiring. Prusek immediate was offered and took the goaltending coach position for HC Vitkovice, where he is today. He also has his hand in a European equipment company called M4G Hockey. One of the more incredible back-ups for his time, it seemed that while he could have had a spot-- Prusek went to the familiar of overseas and knew he'd actually be able to find a spot and succeed in that position. With a 19 game over .500 record in the NHL, who knew what he could have done with a solid starting chance. 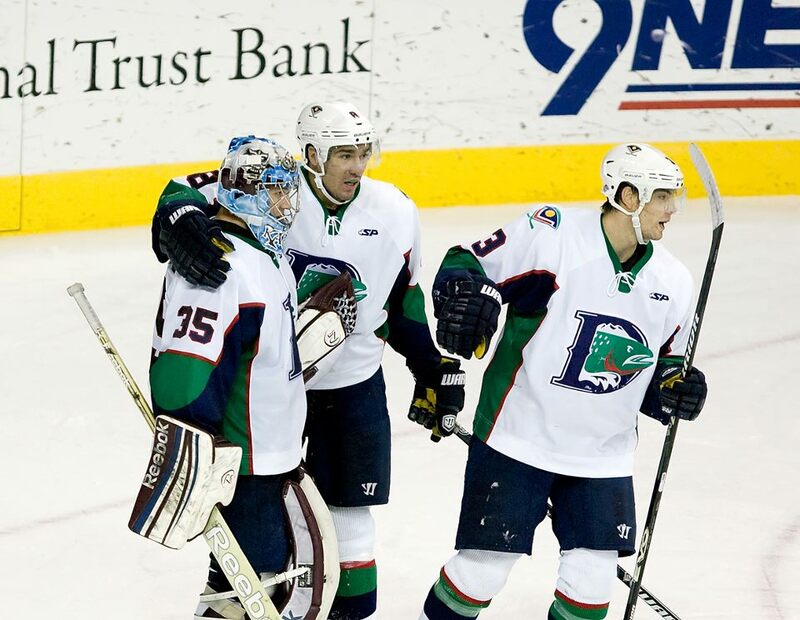 Since we last left you, the Denver Cutthroats have made HUGE strides in the CHL, going from 9th in the League all the way up to 3rd on the back of AJ Gale and Brad Smyth. Even the Sherbrooke Phoenix have made some impressive strides to get into the playoff chase, but still have a lot of ground to make up. The ECHL has the steady up and down of Orlando and San Francisco while the Fort Wayne Komets are the only playoff team out of the four new ECHL teams thus far. While a college career is often useful for some for a short time, others need a longer time. This week's AGM appeared to give the old college try for so long before the NHL came calling-- and it could have been a bad decision. He did have himself a hiccup while playing, but got back to it only to finally call it a career not long after. This week, the profile of Doug Dadswell. Dadswell moved in and out of the Ontario Junior A and B scene, playing for the St. Michael's Buzzards, Thronhill Thunderbirds, and Pickering Panthers in Junior B and the Richmond Hill Rams in Junior A from the 1980-81 season until the 1983-84 season. Going to the NCAA route, Dadswell played at Cornell University for the Big Red starting in the 1984-85 season, playing in 28 games and finishing with a 17-10-1 record, then a 20-7-3 record in 30 games during the 1985-86 season. Dadswell received ECAC Second All-Star Team honors and NCAA East First Team All-American during that season, as well. Foregoing his last two years of eligibility, Dadswell signed with the Calgary Flames before the 1986-87 season, playing mostly in the AHL with the Moncton Flames, posting a 23-12-0 record in 42 games, then going 4-2 in the playoffs. Dadswell also played in two games with the Flames, going 0-1-1. During the 1987-88 season. Dadswell backed up Mike Vernon and went 8-7-2 in 26 appearances with the Flames. However, the Flames got experience back-up Rick Wamsley for the 1988-89 season, sending Dadswell to the IHL's Salt Lake Golden Eagles and he put up a 15-10-0 record with Salt Lake and also spent time with the Indianapolis Ice, going 4-15-0 in 24 games there. Dadswell took off the entire 1989-90 season, coming back in the 1990-91 season with the Canadian National Team were he would post a 16-6-1 record in 20 games. The 1991-92 season saw Dadswell start with the ECHL's Cincinnati Cyclones for 24 games (14-9-1) before getting a call up to the AHL's Utica Devils for 22 games (7-9-2) and appearing in two playoff games-- both losses. 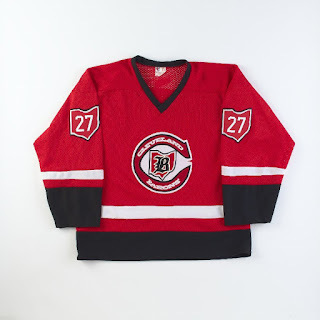 For the 1992-93 season, Dadswell returned to the Cincinnati Cyclones-- who now played in the IHL-- and going 5-11-1 before he moved to the ECHL's Birmingham Bulls for eight games with a 3-3-0 record. Dadswell returned to Calgary in the summer of 1993, but it was to play for the Roller Hockey International team, the Calgary Radz, where he would go 5-4-0 in 10 appearances before he would hang up the pads for good. While Dadswell college accomplishments were good enough to get him into the Cornell Hall of Fame in 2000, I'm sure he'd much like to be considered for his professional career-- but it was much too short to register for some people. While he was unceremoniously shuffled out of the Flames line-up, it seemed taking time off to regroup didn't do him any favors when all was said and done. On Monday, the QMJHL started their week-long awareness week of their Player Support Program entitled "Let's Talk." The deal is that the QMJHL has representatives to every team and it allows the players to come forth with whatever problems they may be having in their life-- on the ice or off-- and give them the help they need in order to actually get better. The program was started in 2009, but seems to be made public just this week. Such a great idea that is long overdue, especially in Major Junior hockey. For a group of 16-20 year olds to be away from their family and face the rigors of a professional life at a developing age; problems are sure to develop to some, if not the majority, of players. While the WHL and OHL have yet made public their programs of the like, I'm sure they will have some players come forth to get something done. 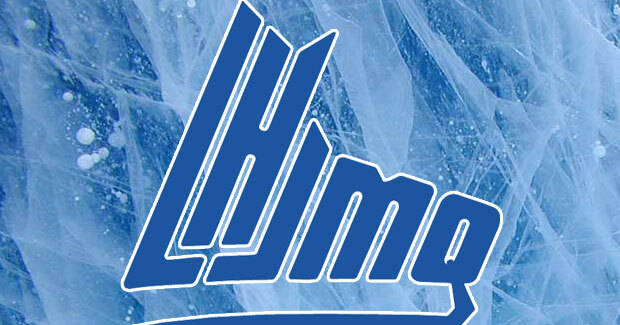 Though is has come in like a lamb, the idea of this from the QMJHL is fantastic. 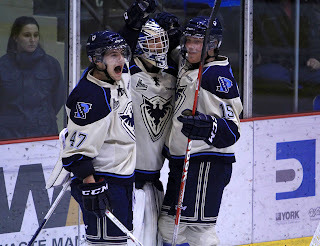 While the QMJHL is fairly centrally located and the travel not too horrible, the fact these kids now have an outlet to talk about and not have to worry about being outed or shown as overly weak is a good thing and a step in the right direction. Especially with mental health and well-being being at the forefront of hockey in the past few years-- it's pretty solid to have a program like this available. Granted, most teams and leagues may have such a thing in place already, the fact the QMJHL has made it public puts them to the forefront and puts it at a team-by-team level rather than a broad-stroke availability for the players in the league. This will be more personal for the players and allow them to adapt as they play and not have to get out of a groove or alienate them by having the player leave the team for personal reasons and start up rumors by media and fans alike. 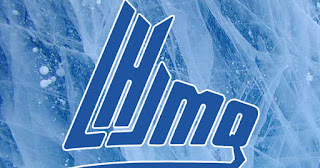 Hopefully, some other leagues will come out publicly with their own outline of their support system-- but if they don't have it already, the QMJHL has laid out a great blueprint for those who want to follow their lead. With many family lineages, the goaltending position is one that is the hardest to have success from top to bottom. This week's AGM is a guy who's father blazed a trail for the Buffalo Sabres and was one of their first great goalies. Although, in the end-- the son couldn't make the same impact and shouldn't have been expected to. This week, the profile of Philippe Sauve. Sauve started with his midget AAA team in Laval-Laurentides and post a 9-10-0 record in 25 appearances and then 7-8 in 15 playoff games. In the 1996-97 season, Sauve moved to the major junior ranks for Rimouski Oceanic in the QMJHL, putting up an 11-9-2 record in 26 games, while in the 1997-98 season, Sauve went 23-16-0 for Rimouski and then 0-5 in seven playoff appearances. The Colorado Avalanche drafted Sauve in the 2nd Round of the Draft and then in the 1998-99 season, Sauve posted a 16-19-4 record for Rimouski and then 6-4 in 11 playoff games. During the off-season, Sauve moved to Drummondville to play for the Voltigeurs for the 1999-2000 season and would go 12-12-2 in 28 games, then was traded to the Hull Olympiques mid-season and would go 9-7-1 in 17 games and 6-6 in the playoffs. Sauve also played for the USA in the World Juniors and go 0-1-1 in two games. Embarking on his professional career, Sauve went to the Hershey Bears of the AHL in the 2000-01 season and finish 17-18-1 in 42 appearances, then 0-3 in the playoffs. The bulk of the starts went to Sauve in the 2001-02 season when he played in 55 games and compiled a 25-20-6 record with six shutouts and then a 3-5 record in the playoffs. Sauve would play 60 games in the 2002-03 season for the Bears, finishing there with a 26-20-12 regular season record and 2-3 playoff record. 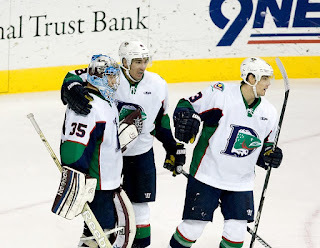 In the 2003-04 season, Sauve was the back-up for the Colorado Avalanche behind David Aebischer and play in 17 games, putting up a 7-7-3 record, but would be sent down to Hershey for the end of the season and play in 10 games, finishing with a 3-7-0 record. During the lockout season of 2004-05, Sauve signed with the ECHL's Mississippi Sea Wolves and would go 13-4-4 in 21 games while going 1-3 in the playoffs. In the summer of 2005, the Avalanche traded Sauve to the Calgary Flames for future consideration, but Sauve would only play for eight games in Calgary (3-3-0); then he would be traded in February to the Phoenix Coyotes with Steven Reinprecht for Brian Boucher and Mike Leclerc; though Sauve would go 0-4-0 in five appearances for the Coyotes. The 2006-07 season was a whirlwind for Sauve. At first, he reported to the Coyotes' AHL affiliate-- the San Antonio Rampage-- for 10 games (4-5-0), but he would get traded to the Boston Bruins for a prospect. Sauve appeared in only two games for Boston, but didn't have a win-loss record. Sauve did go to the Providence Bruins in the AHL and go 10-11-1 in 23 games and then would be loaned out to the Hamilton Bulldogs for six games and post a 2-3-0 record. In the 2007-08 season, the Iowa Stars called Sauve to play for them and he would play for 12 games and have a 5-5-0 record to show for it. Mid-season, Sauve went to Germany to play for the Hamburg Freezers for 13 games and have a 9-4-0 record, then 3-4 playoff record. At the end of that season-- Sauve hasn't been heard from. Though it was hard to deal with the shadow that his dad casted over him with his name, Philippe did what he could to make his own mark. Whether it was mismanagement by those who tutored him or his skill being overvalued, Sauve seemed to just never reach the brass rings set out for him.